The human cost of Mexico’s war on drugs has been well documented, with almost every news story written about the country ending with the now obligatory statistic that over 60,000 people have been killed since December 2006. But there is an even bigger killer in Mexico that rarely makes the headlines and fails to provoke such large media frenzies or public demonstrations: dangerous driving. Mexico ranks among the ten worst countries on earth for road traffic deaths and it has the second most dangerous roads in Latin America, behind Argentina. According to British newspaper The Guardian, road traffic accidents in Mexico have caused 80,000 deaths in the last four years, with an average of 16,700 people killed each year since 2006. An article in The Economist last year placed the death toll even higher, at 24,000 fatalities and another 600,000 injured every year. This was corroborated by the Cruz Roja (Red Cross), which said 24,129 people died on Mexico’s roads in 2011. Locally, the situation is equally desperate. From January to June this year, 889 people died in traffic accidents across Jalisco, according to Spanish-language daily El Informador. Alcohol was a factor in around half of these incidents, which represent the leading cause of death among young people in the state. To underline the gravity of the problem – recently described as “an epidemic” by Mexico’s Ministry of Health – four more people were killed in accidents across Jalisco on November 18, the third Sunday of the month adopted by the United Nations as the World Day of Remembrance for Road Traffic Victims. While fighting drug trafficking is understandably a top government priority, Mexican officials could make the country a much safer place by also placing greater emphasis on road safety. Implementing practical driving tests and clamping down on drunk driving would likely save many more lives at a tiny fraction of the cost of combating drug gangs each year. But why then, is there no audible clamor for the government to prioritize road safety? Ciudad Para Todos promotes these alternatives through conferences, workshops and media, but they have “met with a lot of resistance” when working with the authorities, Soto says. The problems on Mexico’s roads are manifold. Drunk driving is incredibly common – especially on weekends – as is the use of cell phones while driving. A study by the Pan-American Health Organisation (PAHO) estimated that each week in 2008 some 200,000 people drove while drunk on Thursday, Friday and Saturday nights in Mexico City. There is no sense of social shame at being caught driving under the influence in Mexico and prosecutions remain rare, so drivers continue to drink and drive with impunity. In fact, prosecutions for any driving offense are rare, because most people tend to pay police an “on-the-spot fine” (otherwise known as a mordida or bribe) in lieu of being given a ticket or taken to the police station. Another major issue is that just 14 of Mexico’s 32 states, home to over half the population, grant licenses without setting a practical driving test. Here in Jalisco, for example, it is not necessary to prove one’s skills among traffic in order to acquire a driving license. Applicants are merely asked to drive around a few cones in a deserted parking lot, stop before traffic lights, and then park their vehicle. As a result, people not properly fit to drive are free to take to the roads, leading to a host of dangerous situations. Many drivers weave between lanes at will, without signaling with their indicators, while others leave so little space between themselves and the car in front that there is neither time nor room for maneuver in case of a sudden halt. Incomprehensibly, many drivers and passengers eschew seat-belts, as if drastically improving your chances of survival in a car crash were not worth the effort of strapping yourself in. But it is not always those in the vehicles at risk. Around half of those killed in road accidents each year are cyclists or pedestrians, who receive little respect from those in cars and even less from bus drivers notorious for their reckless driving. 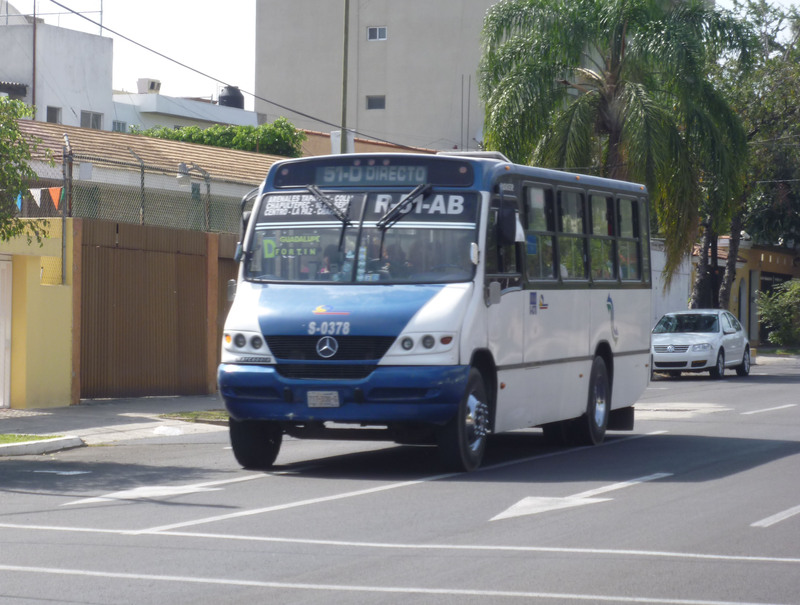 According to the State Attorney General’s Office (PGJEJ) and cyclist group GDL en Bici, 27 cyclists were killed on the roads of Jalisco from January to October 23 this year, with public buses involved in 11 of those deaths. Another 25 cyclists were killed in 2011 and 35 in 2010. Pedestrians are equally at risk; they almost never have right of way in Guadalajara and at many junctions there is no safe time for them to cross the road. The few pedestrian crossings with traffic lights are situated almost exclusively in the historic center, with the rest of the city largely bereft of meaningful road safety infrastructure. While there is no lack of road safety legislation in Mexico, the biggest problem seems to be enforcing it and creating a culture of road safety among drivers. 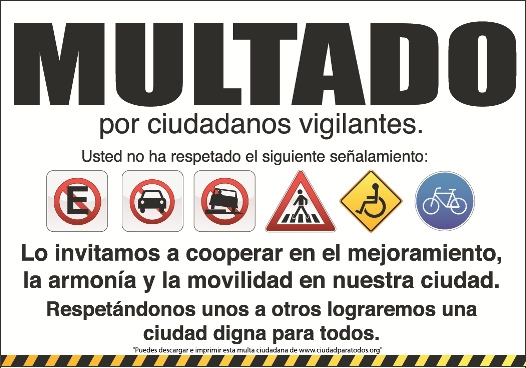 Ciudad Para Todos is trying to promote a more conscientious culture by handing out “multas ciudadanas,” or “citizen’s fines,” to shame reckless drivers when the authorities fail to sanction them. These tickets can be downloaded from the Ciuadad Para Todos website, printed out and slapped on vehicles parked in inappropriate places in order to draw attention to them. To find out more about Ciudad Para Todos, visit http://www.pasaloaunmejor.wordpress.com. The website of GDL en Bici is http://www.gdlenbici.org.